It has become commonplace in Medieval Studies to speak of the “formation of a persecuting society” in Catholic Europe of the twelfth and thirteenth centuries. The efforts of St. Raymond of Peñafort and the Order of Preachers to convert Jews, Muslims, and other non-Christians is a conspicuous example. Edmund J. Mazza’s The Scholastics and the Jews, however, marks a major historiographical revision. While in no way diminishing the reality of Jewish suffering across the centuries, Mazza identifies the origins of missionary overtures to non-believers not so much with the drive for homogeneity as for holiness. Through an examination of the works of St. Raymond, St. Anselm of Canterbury, Peter Abelard, Alan of Lille, St. Thomas Aquinas, Blessed Ramon Llull and others, The Scholastics and the Jews uncovers the unsung role that reason and rational argument, as well as confession and conscience played in the creation of preaching programs and pastoral care aimed first at lay faithful and heretics—but ultimately at infideles. The Scholastics and the Jews, above all, is devoted to re-discovering a tradition, the development and implementation of a medieval world-view, or sacramentality, which saw the institutions and inhabitants of this world not primarily as means to the pursuit and maintenance of power, but as sanctified symbols reflecting God’s own infinite majesty and simultaneously, flesh-and-blood sinners in need of redemption. How this Scholastic “hermeneutic” at one and the same time hindered—and helped—the cause of tolerance is a tale largely yet untold. 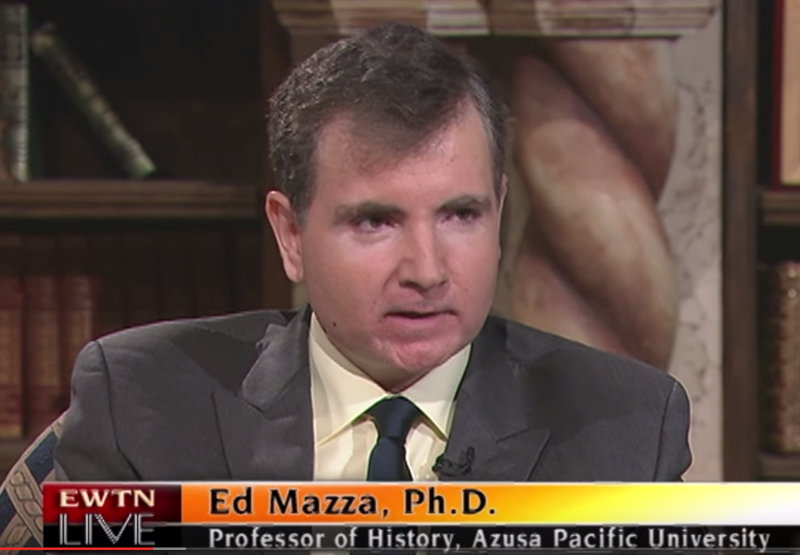 Edmund J. Mazza is Professor of History at Azusa Pacific University in Los Angeles where he teaches Ancient, Medieval, and Renaissance and Reformation History. Dr. Mazza has contributed chapters on these subjects for Cognella Press’s forthcoming, A History of the Premodern World. Dr. Mazza is also the author of the brand new book The Scholastics and the Jews, Coexistence and Conversion and the Medieval Origins of Tolerance. Mazza and his wife were recent guests on EWTN Live with Fr. Mitch Pacwa in conjunction with Mazza’s July 2015 Conference at New York University commemorating the 750th anniversary of the birth of Dante Alighieri. In 2012 Mazza organized “Mary, Sign of Faith: An International Symposium” in Rome. In 2010 he was selected for a National Endowment for the Humanities Summer Seminar, “Aristotle on Truth and Meaning” at San Diego State University. Dr. Mazza is the author of several articles in the online journal Catholic World Report. Mazza’s research has taken him from the Vatican’s Secret Archives to the lost tomb of St. Francis Xavier in Malaysia. He is a frequent guest on AM 930 Immaculate Heart Radio’s “Terry & Jesse Show.” Dr. Mazza often speaks at the Sacred Heart Chapel in Covina. His DVDs and CDs on Church History are available from Lighthouse Catholic Media/St. Joseph Communications.